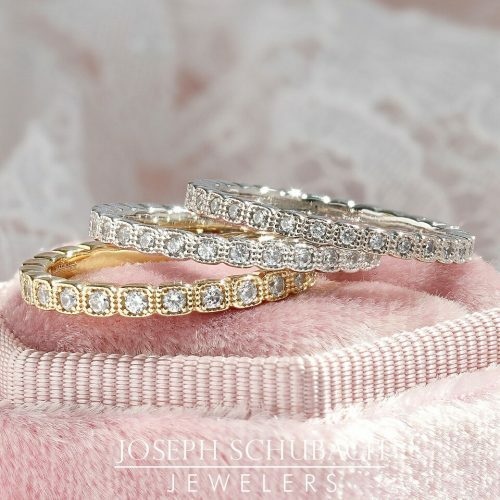 Why stack your wedding or anniversary bands? Many women talk of symmetry. The look of three bands has a certain visual appeal that can’t be denied. Some just like more bands. More bling basically. If you can stack your bands and build out your collection, why wouldn’t you? Others choose anniversary bands to compliment milestones in a marriage or parenting. There is no one-size-fits-all reason. But we love them anyway. 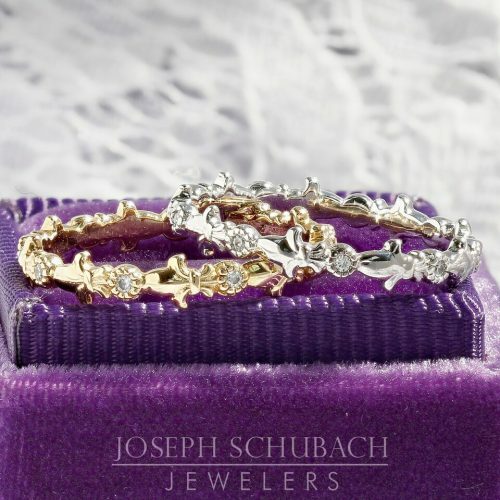 Here are some of the pieces from our stackable anniversary and wedding band collection. Our full collection with pricing. 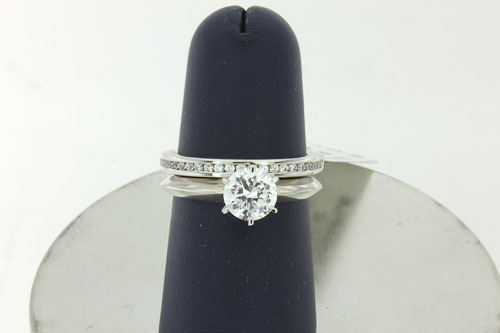 A bezel set marquise and round diamond wedding band. A marquise and diamond shape wedding band with diamonds. 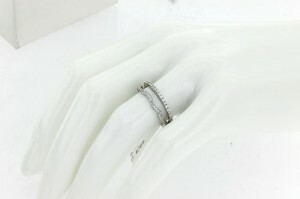 A bezel set marquise diamond wedding band with milgraine. 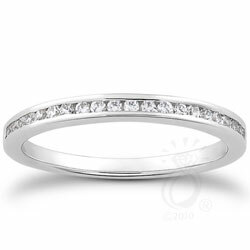 A marquise shape wedding band with round diamonds. 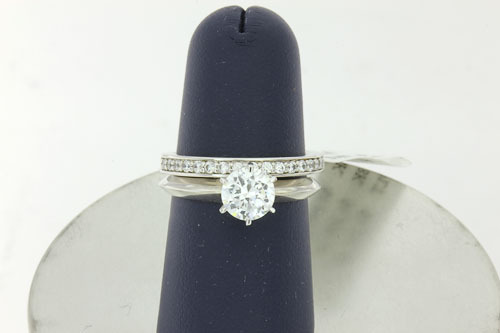 A marquise shape wedding band with single diamond. 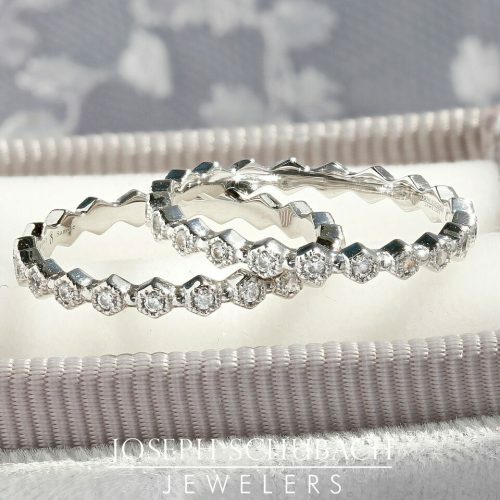 A hexagonal wedding band with round diamonds. 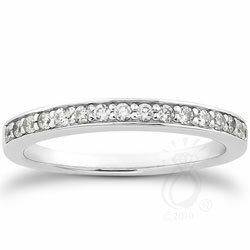 A square shape milgrain wedding band with round diamonds. 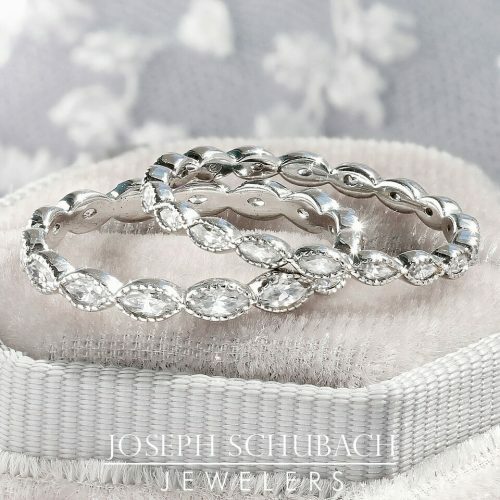 A fleur de lis wedding band with diamonds. 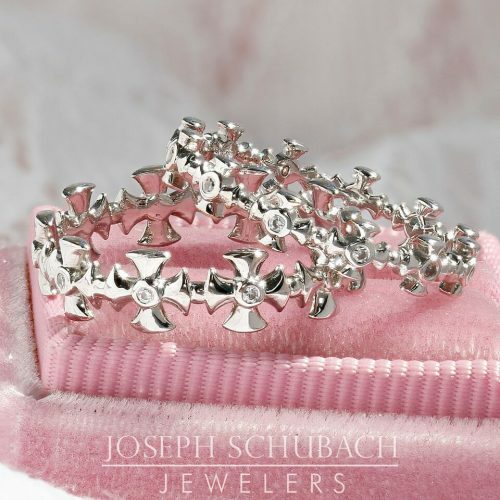 A beaded Maltese cross wedding ring with diamonds. 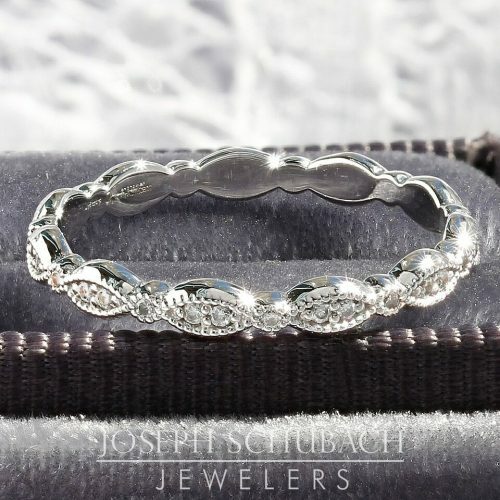 Maltese cross wedding band with diamond with a smooth finish. 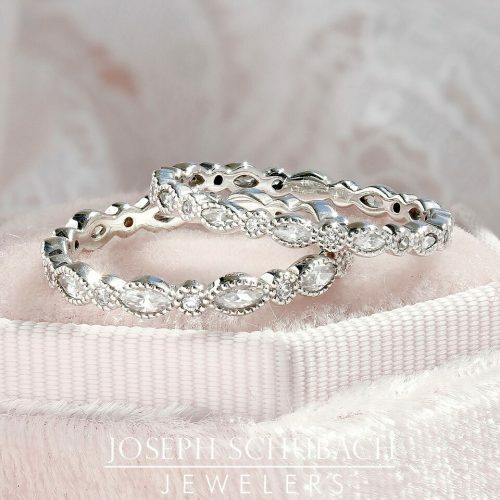 A smooth paisley design wedding band with diamonds. 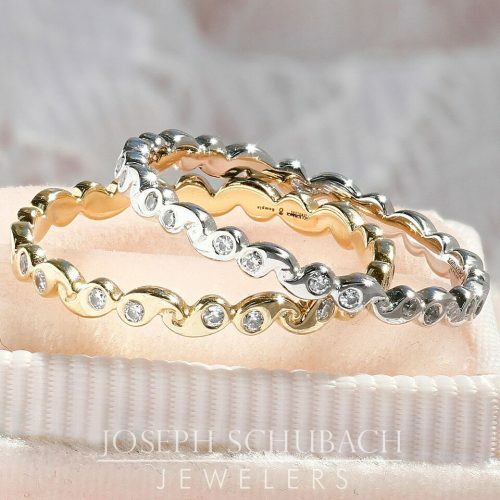 Anniversary or stackable wedding band. Many men are at a loss when it comes to buying a gift for their wives (no shocker, right?). This can often be a source of dissension since wives generally expect something personal and meaningful (again, no shocker). Enter the anniversary ring, stage right! Our advice (which we can happily help you with in person or over the phone): choose an anniversary ring that pairs nicely with the wedding and engagement rings. Generally, women with simpler wedding bands like the added sparkly “oomph” of an anniversary band with a little more embellishment. 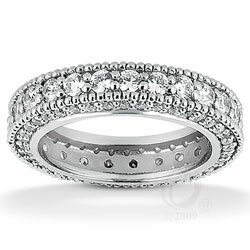 Eternity bands are also a popular choice. While some women will wear anniversary bands alongside their engagement and wedding rings, others wear their new anniversary band on the third finger of their right hand instead of their left. 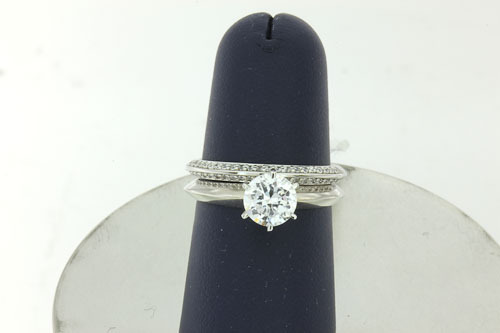 Others choose to wear the anniversary ring in place of their wedding or engagement rings. Bottom line: don’t purchase any old gift for an anniversary. Make it count. This also provides you more leeway for future anniversaries if you just buy flowers and chocolate! 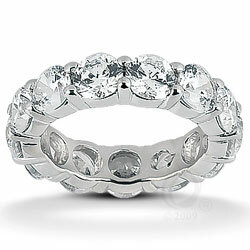 Anniversary rings are a perfect way to renew your love. 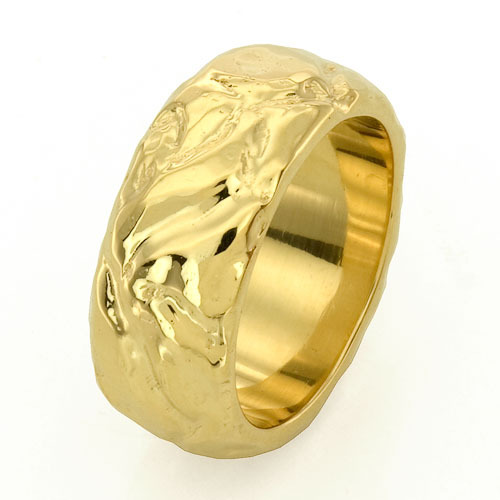 Anniversary rings also offer the opportunity to take some chances with the design and material. 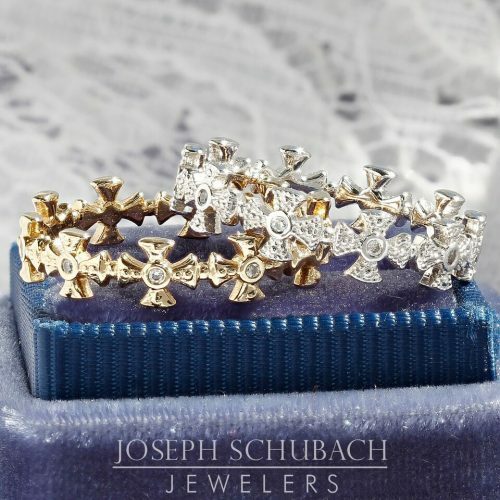 Moissanite is more than just a diamond simulant; it’s a lab-created diamond and at Joseph Schubcach Jewelers, we use only Charles and Colvard moissanite, the best in the industry. 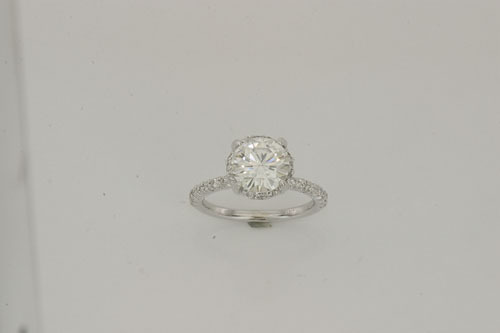 By using moissanite, you’re making an eco-friendly choice as well an affordable one. 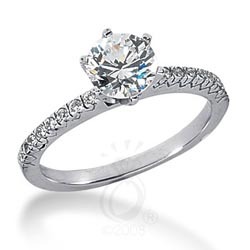 So this anniversary, keep it affordable yet still totally stunning with moissanite! 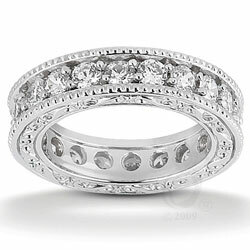 Milgrained Anniversary Band With Round Stones Milgrained anniversary band with between 1-1.15ct t.w. 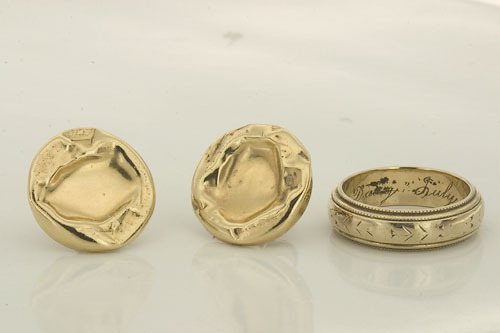 round stones on all three sides, 4.6mm wide. 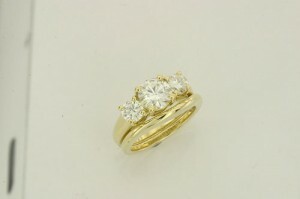 Round Stone Anniversary Band Shared prong anniversary band featuring between .84ct-.90ct t.w. round brilliant stones, 2mm wide. 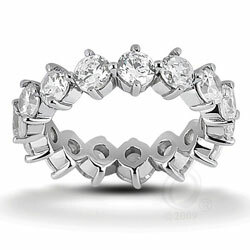 Style 10289 Prong Set Round Brilliant Diamond Anniversary Band Prong set anniversary band between .60ct-.68ct t.w. round brilliant diamonds, 3mm wide. 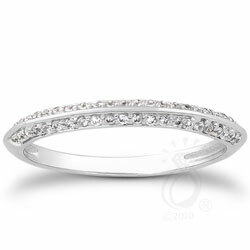 Style 10290 Round Brilliant Diamond Anniversary Band With Engraved Sides Engraved anniversary band with between .87ct-.96ct t.w. round brilliant diamonds, 5mm wide. 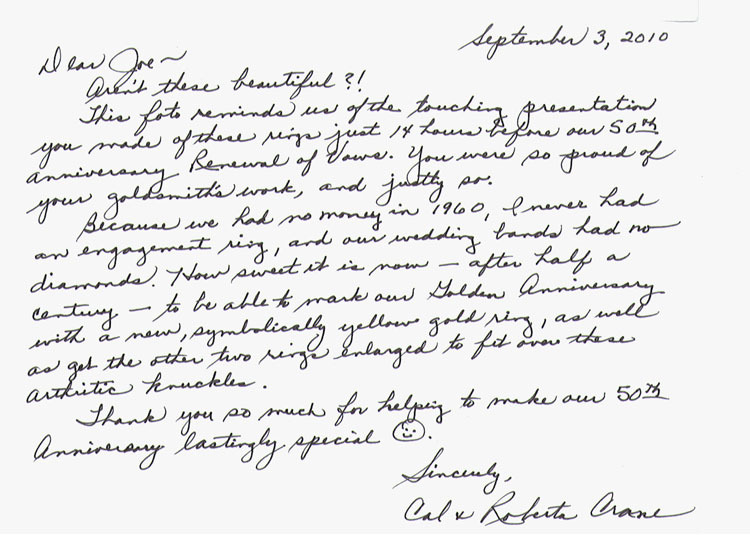 Cal and Roberta contacted us to duplicate her wedding band in 18kt yellow gold, which we did nearly identically! 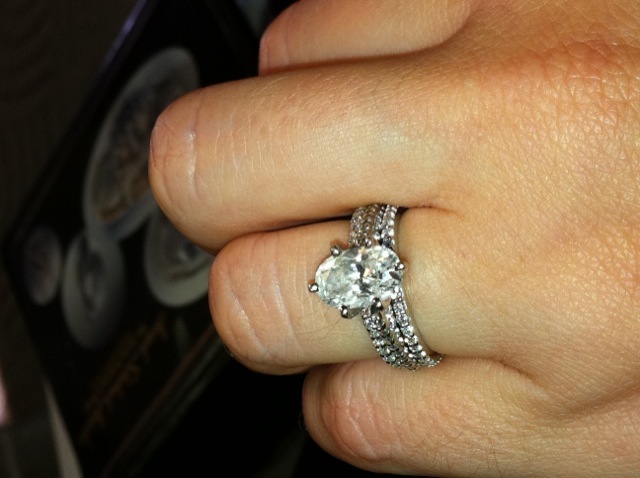 We also enlarged her original wedding band to fit over her knuckle keeping the design flowing all the way around. 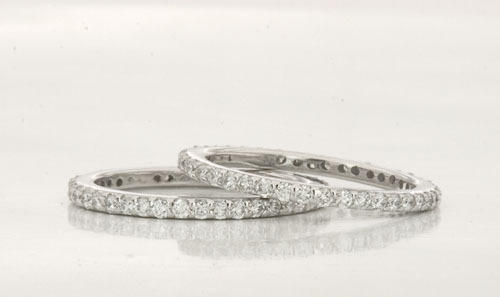 1/2pt diamonds or 1pt diamonds – what’s your preference? 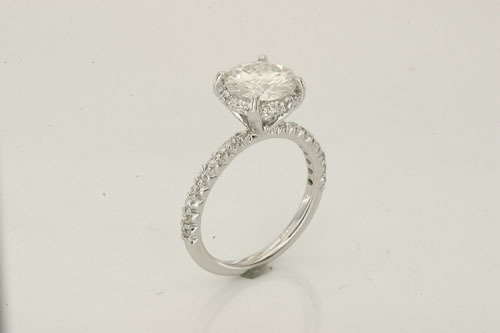 We’re working on a new design and trying to decide between using 1/2pt diamonds or 1pt diamonds on the shank. 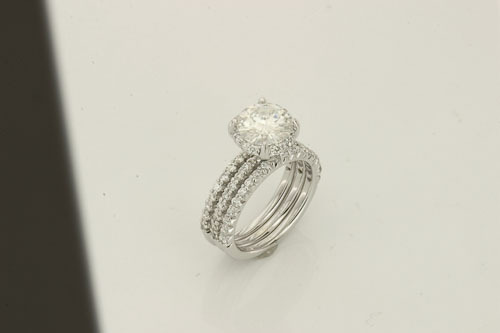 While both are very petite, the 1/2pt stones are so delicate and gorgeous! 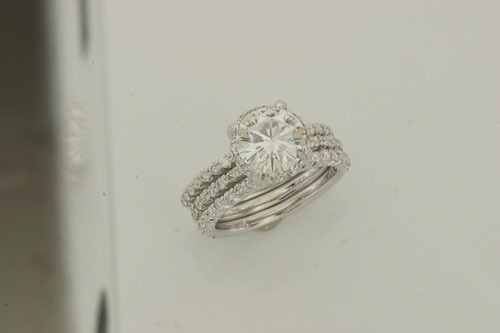 This picture shows two different bands using 1/2 and 1pt diamonds. 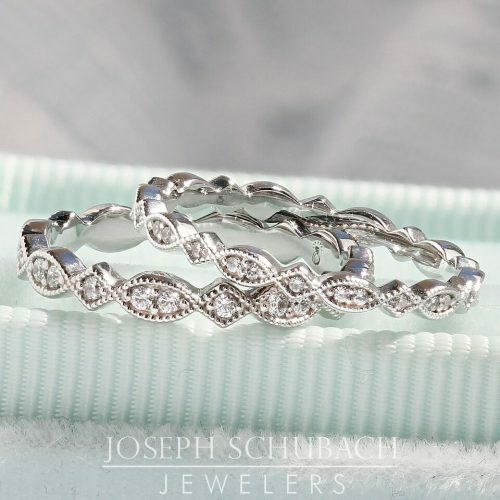 Hit “like” if you prefer the outer ring or leave us a comment! We’ve recently seen several of our customer requesting not one, but two wedding rings – one for each side of the engagement ring. I recall many years ago hearing about this trend in Australia and New Zealand. Has it finally caught on here? 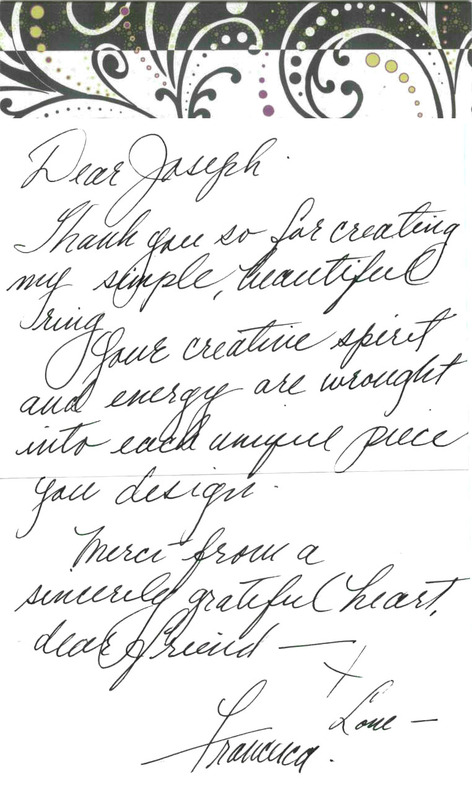 Here is an example from one of our customers. 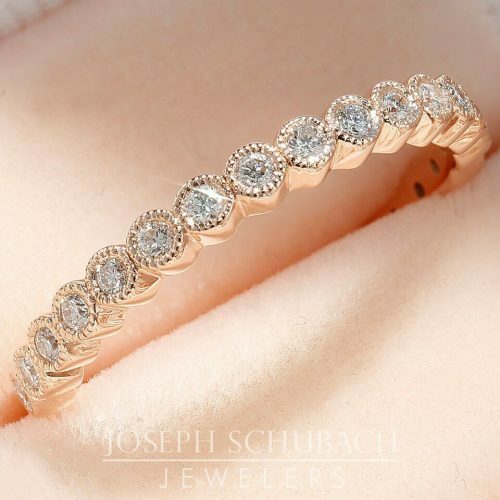 They purchased a ring very similar to our style 9617 and added an anniversary style band on each side. We just finished this yummy ring for a local client of ours. It’s new to the line, exclusive to us, and not on the site yet. If anyone wants to ooohhh and ahhhhh over it, give us a call and we’ll ooohhhh and ahhhhh with you! We’ve shown it with a couple of matching wedding bands. Seems that having multiple wedding bands is all the rage right now. 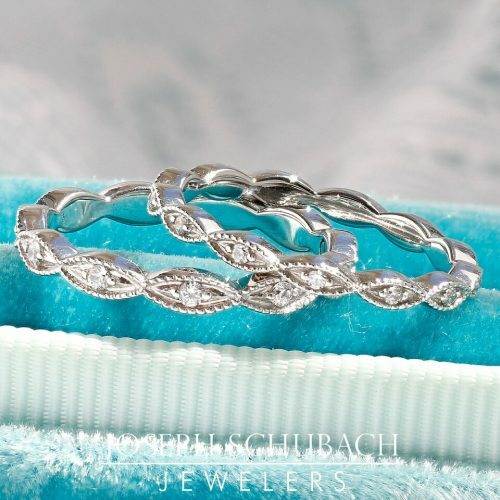 Also, multiple wedding bands make great anniversary and occasion presents! 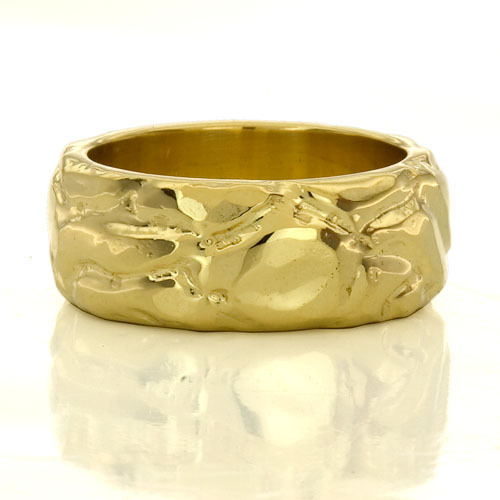 As usual, you can have this ring made with any stone, metal and combination you prefer! Better photos forthcoming. Our long time friend Francesca came to us to make a custom 18kt yellow gold wedding band for her and her husband Leo’s 50th wedding anniversary. She wanted an old world feel, something that looks used and worn, something heavy that feels nice to the touch and smooth to wear. Fran liked the way a pair of her earrings looked and thought they could be the inspiration for the piece that would signify their special day. 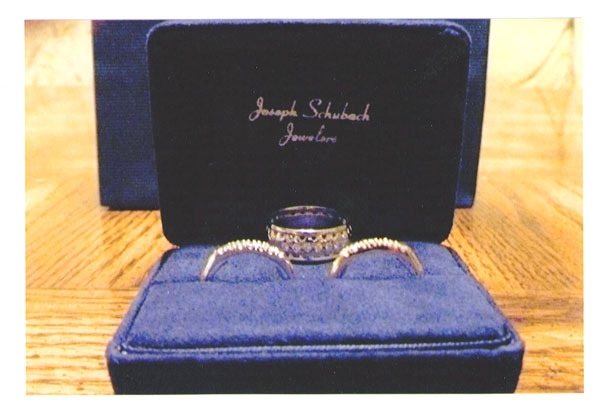 The wedding band in the image with the earrings was the original wedding ring that Fran’s father gave to her mother. This piece, of course, is extremely sentimental to Fran and her family. We can only hope that the ring we made for Fran will someday have a similar meaning to her family. 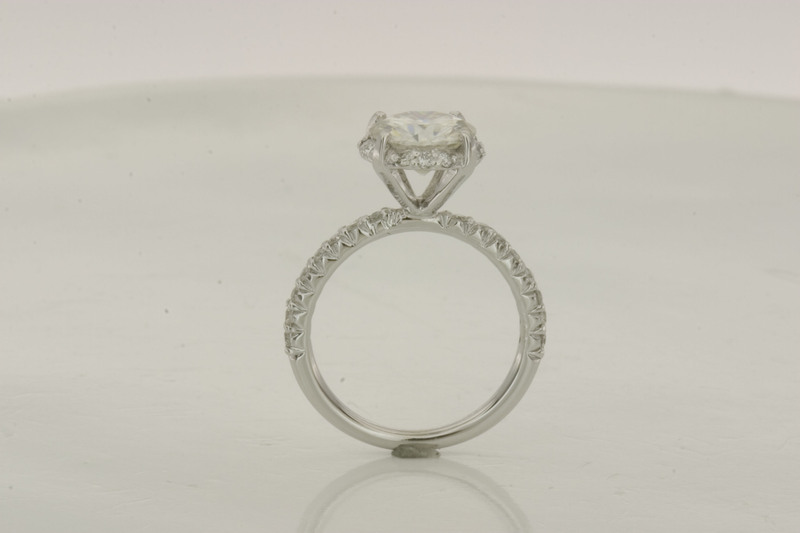 Have you thought of a family heirloom that you would like to create? If so, we would be honored to help you with this!